Measurement Resources has partnered with the Ohio Department of Health to conduct several impact evaluations and needs assessments. The focus of Measurement Resources’ work has included an evaluation of programs dealing with the quality of HIV/AIDS care and prevention; understanding the current health needs of mothers and children; researching the impact of the State’s Home Visiting program, and estimating the impact of Ohio’s WIC program. In HIV medical care, viral suppression is key for improving public health outcomes and for the quality of life for people living with HIV/AIDS (PLWHA). Before viral suppression can be achieved, PLWHA must engage and remain in high-quality HIV care. Over the past three years, The Ohio Department of Health (ODH), Bureau of Health Services, HIV Care Services section, has engaged in a needs assessment conducted by Measurement Resources to uncover the experience of PLWHA and to identify solutions to increase the rates of PLWHA engaging and remaining in care. Year one sought to identify a clear understanding of the attributes that have predictive value for people not being in care or not remaining in care. Year two continued to examine the predictive factors that prevent PLWHA from entering and remaining in HIV care, as well as examining the relationship between comorbidities and engagement in HIV care. 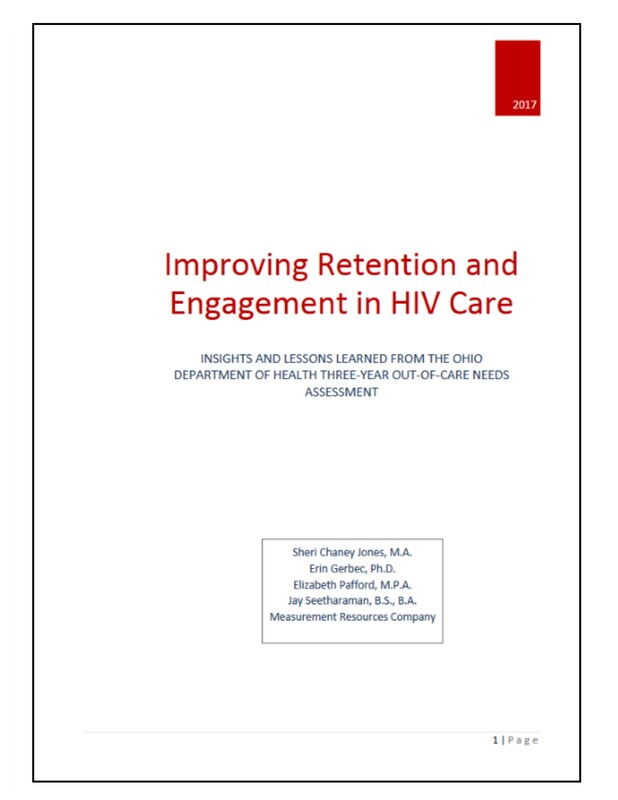 The third year of the study explored Ohio’s HIV system of care strengths and the system’s readiness to address the inabilities and failures of Ohio’s PLWHA to access and stay in HIV care. Results provide valuable insights into the perceived strengths of the HIV care system which help increase the number of PLWHA engaging and remaining in care. In addition, results identify potential barriers that will need to be addressed for Ohio to improve engagement in care and ultimately achieve greater viral suppression rates.